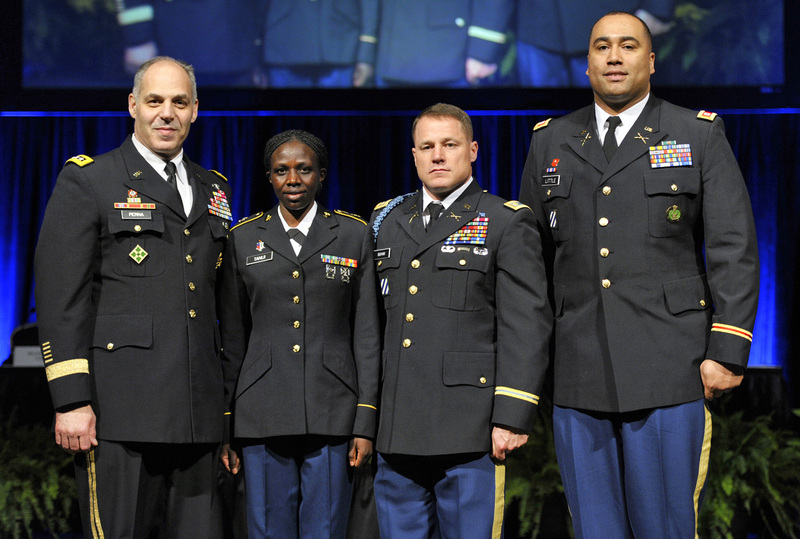 Three soldiers, selected as the 2016 Army athletes and coach of the year, were honored at the Association of the U.S. Army Global Force Symposium and Exposition in Huntsville, Alabama. The awards were presented during the professional development forum at the symposium by Gen. Gustave Perna, commanding general, U.S. Army Materiel Command. Maj. Donald Bigham, who has served in Kuwait, Afghanistan and Bosnia during his 23 years of service and is a USA Powerlifting Team member and a Human Performance Officer at Fort Benning, Ga., was recognized as the 2016 Male Athlete the Year. The 2016 Army Female Athlete of the Year is Spc. Susan Tanui, a world-class runner, who is serving in the Regular Army as a dental assistant and is the outgoing Clinic Practice Manager at Fort Riley, Kan.
Capt. Carl Little, a former noncommissioned officer, and now the assistant professor of Military Science, Saint Augustine’s University, Raleigh, N.C., is the 2016 Army Coach of the Year. In 2016, Bigham competed in the International Powerlifting Federation Raw Powerlifting Championship in Killeen, Texas – a professional, Olympic-caliber competition with more than 62 countries represented. He took four gold medals at this event. He also took first place at every World and National Powerlifting Competition in 2016 to include: The Arnold Sports Festival, the Military Nationals, the North America Regional Powerlifting Championship, the Raw National Powerlifting Championship, and the Lee Haney Games Powerlifting Championship. As a member of the U.S. Army Powerlifting Team – USA Powerlifting, last year he participated in six world- and national-level events, where he distinguished himself as a superior Army athlete. He broke numerous world powerlifting records in the International Powerlifting Federation and League. Also, he broke more than 10 national and state records during 2016. Bigham’s lifts – in 2016 – as a drug-tested 181-pound Master Powerlifter are: Squat – 601 pounds; Bench Press – 363 pounds; and Deadlift – 625 pounds – for a total of 1,578 pounds. He is married to Kelly of Rock Hill, S.C., and they have five Children: Dillon (currently deployed with the Air Force), Derek (currently stationed at Fort Bragg), T.J. (14), Townsend (12), and Auten (9). Tanui placed second overall at two U.S Armed Forces Championship races, the Marine Corps Marathon and the Army Ten-Miler. This accomplishment contributed to the All-Army Team winning both these events that were held in Washington D.C.
She also competed in the USA National Cross Country Championship in Bend, Ore., helping the All-Army Team to emerge victorious. Tanui volunteers at the Fort Riley – Army Community Services, the Intercontinental Hotels Group and at the Post Library as a library aid. She also has participated in local races in Kansas, and, due to her exemplary athleticism, she has been selected to become a member of the prestigious Army World Class Athlete Program at Fort Carson, Colo.
Little has served as company commander, Delta Company, 1st Battalion, 50th Infantry Regiment, Fort Benning Ga; battalion S4, 1st Battalion, 10th Field Artillery Regiment; company fire support officer, 2nd Battalion, 69th Armor Regiment; and platoon leader, Alpha Battery, 1st Battalion, 10th Field Artillery Regiment. He was the head coach of the All-Army Men’s Basketball Team that won the gold medal at the 2016 U.S. Armed Forces Basketball Championship. This was the All-Army Team’s first gold medal since 2004. The team finished this competition with a perfect 7-0 record. Overall, the record for the 2016 All-Army basketball season was 11 wins – zero losses. As a result of his coaching abilities, three of his players were selected to the All-Tournament Team and three players were selected to the U.S. Armed Forces Team that competed in the SHAPE International Basketball competition where his soldiers won the Gold Medal. In the local community, Little serves as the assistant men’s basketball coach at Columbus State University, and also volunteers at various camps and clinics.